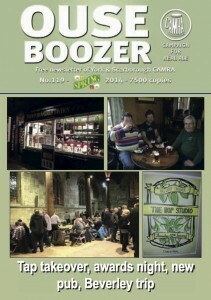 This entry was posted in OB119, Ouse Boozer, Ouse Boozer Magazine on 25th February 2014 by York CAMRA. 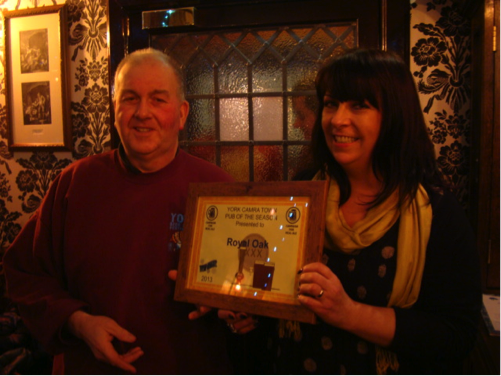 Pressure of numbers meant that a larger coach had to be put on for the trip to the White Bear, Stillington on 23rd January to present the Country Pub of the Season award for Winter 2013. With members also making their way independently we had in excess of thirty thirsty travellers, just as well the White Bear’s darts team had an away fixture that night! With a good turn- out of pub locals too there was plenty of demand but this was met with the usual impressive supply, in this case: Sam Smiths Old Brewery Bitter, Leeds Pale, Ringwood Best, Rudgate Snow Wonder and Hop Studio Porter. The bar staff coped most ably and very soon most of us were on our second (or third) pint. Chris made a brief speech in which he explained that since the White Bear’s award in Summer 2010 this second presentation was unique for country pubs in our branch area and that only one York city pub had achieved such a “double” in that timeframe. The second award was in recognition of Phil and Sue’s continuing work to provide variety and choice, particularly of Yorkshire beers, often from some of our smaller breweries. Phil expressed his delight at the recognition and provided some interesting anecdotes comparing life in London and Yorkshire: Yorkshire won! Unfortunately Sue was upstairs convalescing, we hope she is back at her customary station behind the bar soon and that the cheer she got from the bar provided suitable motivation! 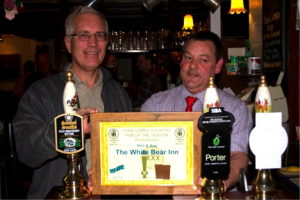 This entry was posted in OB119, POTS, Presentations, Pub News and tagged White Bear Stillington on 25th February 2014 by York CAMRA. After 6 years at the Waggon and Horses, Paul and Mandy move across the street to take over the Rook and Gaskill. Moving into the Waggon are Tom and Paulina Renshaw. IT’S easy to forget just how grim the Waggon & Horses once was. Walk in today and you see a busy bar room, a vast beer choice and walls covered in a colourful collage of pump clips – but it wasn’t always like this. Far from it. This entry was posted in Pub News and tagged rook and gaskill, waggon and horses on 2nd February 2014 by York CAMRA.